Knight Hill Land Surveying Services, Inc.
Click survey type to read details. 1 Obtain information from the town or city, municipality tax assessor on the internet site if available, if not at tax assessor. Essential information is subject lot owner and abutters usually within 200 ft of subject lot lines and also need tax map and lot number. Other vital info if available is the roadway right of way width and location documents the town/city clerk may have reference to or city engineer/planning department might have on file. Generally run chain of title back to lot creation to understand its history and easements affecting the site. 2 Sending out an abutter's notice of the impending field survey is done when determined obligatory. This explains the road nails and/or hub and tacks we set are merely survey reference points (not boundary markers) used to measure angles and distances (from convenient spots) to monuments and site details. This notice also weeds out hostile abutters who do not wish the survey crew on their property, by asking any abutter to give the office a call and let us know your wishes and also to let us know if you have any unrecorded plans and deeds necessary for a successful boundary line determination. 3 The field crew is sent out to do boundary monument reconnaissance. It is imperative to do a thorough patient search for controlling monumentation. 4 The field survey hubs and lines are set up before turning angles to monuments and details. In the woods, lines of site are cut out giving sight distance to each hub and tack set up point for the instrument to collect data from. The survey lines form a closed loop so an error of closure can be calculated as required. 5 Two-man field crew runs a field survey around the traverse loop spinning angles and measuring distances electronically absorbed by the data collector to locate and map boundary/site details or simply locate a new foundation to produce a foundation certification plan for the building inspector. 6 The field data is then downloaded in the office into an AutoCAD computer drawing. This field data is analyzed against the controlling deed and plan data. Property lines are then calculated into a certifiable boundary worksheet drawing and if necessary coordinates to do a radial stakeout are calculated. The field crew will return to site and use their radial stakeout data to search for important record monuments not found, by setting up and turning calculated angles and measure distance to search for a suspect monument(s). 7 Once all existing monuments are found then the determined lot lines are shown on the AutoCAD drawing boundary worksheet. Lot corner coordinates are calculated and uploaded into the data collector to set missing monuments. 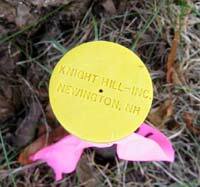 8 The field crew returns to site and sets required monuments including 3/4 inch iron pin with surveyor's cap or concrete or granite bounds or railroad spike in pavement and/or drill hole marks in stone walls. 9 Field layout is then downloaded into AutoCAD drawing to verify accurate layout. The monuments are labeled in the drawing worksheet with type and date set. The boundary worksheet is plotted and certified for office file and copied to client. The computer drawing is then backed up and archived. 10 To find the most valued use of the property the edge of wetlands are flagged by wetland scientists and field located by a 2-man survey crew. This data is added to the boundary worksheet. The municipal setback lines are added. A plausible use of the property is then determined such as residential or commercial lots. The surveyor can then commence with subdivision proposal plan and/or this information could be used by an attorney for estate value planning. 11 A topographic survey shows elevation contours. This elevation information may be necessary to determine the most valuable use of the property as in subdivision design. An elevation datum can be assumed unless municipal zoning or project coordinator requires a specific datum or for government FEMA work. FEMA work usually requires the elevation datum to be (NGVD29) National Geodetic Vertical Datum of 29 is usually required for FEMA Elevation Certificates or (LOMA) Letter of Map Amendment to show subject property or just the building does not lie in the flood plane. The (BFE) Base Flood Elevation on (FIRM) Flood Insurance Rate Maps stipulates the height of the water which causes flood insurance to be necessary. An elevation level loop is necessary to transfer a published NGVD29 or known elevation/benchmark to a (TBM) temporary benchmark on subject property, such as a spike in a utility pole. This work is carried out by a 2-man field crew. There must be at least two TBMs per site or more depending on size of subject lot. A two-man field crew then surveys the varying elevations on the subject property (and usually overlapping about 100 ft depending on slope) by obtaining spot grades. The site is peppered with spot grades some times on a 50 ft grid or less as required. This field data is then downloaded into the AutoCAD drawing. Contours are then office calculated and labeled on the boundary worksheet creating a contour map to be modified into a particular style plan for certification and presentation. 12 A full-blown standard boundary survey plan is always recommended to be recorded at the appropriate register of deeds. It is not mandatory to record the plan but by recording it the information can be used by other surveyors to help prevent overlaps and gaps. In New Hampshire when a boundary plan is recorded a copy must be sent to the municipal record department. A recordable plan is an ink on mylar drawing drafted to municipal and state standards. Plans which must be recorded include subdivision, lot line adjustment, condominium, family division, boundary line agreement, conservation easement, view easement, land court, (ANR) approval not required to name a few. These plans should include all the abutter data and subject property bearings, distances, areas, easements and legal documents relevant to the subject property and usually site details depending upon type of plan. 13 Maine allows property divisions (2) through land use laws 30A SS 4401. This allows the land owner to divide out a lot after five years and one more after an additional five years. The lot must meet zoning and State rules to build on. In Maine subdivision means the division of land or buildings into three or more lot/units within a five year period. (see State Statute for specific details). 14 Right of way determination is required to establish a property line location along a road or the location of a right of way for a specific purpose within the subject lot. 15 Utility and/or road easement surveys are usually required by civil engineers before designing any new utility projects to be aware of impediments such as existing easement rights or to understand obstructions prior to creating an easement for a specific utility or road. 16 Massachusetts has a land court. Once a property has been put into the land court system, no adverse claims can be made against the property. Any further subdivision or sales are controlled by the land court and their rules. Normally, an attorney will act as the liaison agent between the surveyor and the land court. The field survey has to be conducted and drafted for registration under their stringent rule procedures. Land court plans of record usually make adjoining property surveys easier than ordinary. 17 As-built surveys are done to show existing conditions including record boundaries, existing utilities, easements, elevation data and on-site details. This information is normally required for engineering design on proposed projects or subdivisions. Utility research must be conducted in town/city engineering records office, department of transportation, water department, sewer department, electric and gas utility offices to name a few as required. (ALTA) American Land Title Surveys are as-built surveys to the strict 2011 ALTA/ACSM rules. ALTA surveys are usually required for lending institutions attorneys prior to any kind of mortgage. Road detail/utility surveys are basically as-built surveys as well but may not require accurate property line delineation. This as-built data is then formatted into a particular plan type. Serving landowners, land buyers, civil engineers, architects, and municipalities in New Hampshire, Maine, and Massachusetts. Protect your land investments, prevent costly mistakes, and avoid boundary disputes with a professional title search and land survey. © Copyright Knight Hill Land Surveying Services, Inc.